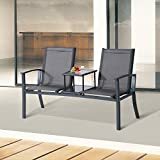 This Outsunny 2 seater metal chair is a great addition to any garden of patio, perfect for two people to enjoy the summer sun and even have a table in center to place their drinks. Made with a metal frame and seating covered with textilene. The chair is comfortable and perfect for relaxing and enjoying the outdoors. The center table is topped with a 5mm tempered glass, perfect to hold your drinks or food. A great addition to your outdoor living area! This entry was posted in Home Decor Supplies and tagged Aluminum, Armrest, Bench, Chair, Companion, Fabric, Garden, Mesh, OUTDOOR, Outsunny, Patio, Seat, Seater, Table, Textliene, Tier by 4logis. Bookmark the permalink.